E.g. 8x42. The number ‘8’ denotes the magnification and means an object appears to be 1/8th of its’ actual distance away. Using this rule an object 40m distant appears to be only 5m away. ‘42’ is the diameter of the objective lens (the large end) in mm through which light enters the binocular. Z or B stand for porro prism binoculars. The basic optical design of these ‘traditional-shape’ instruments mean they tend to deliver better optical performance for your money compared to roof prism (D) binoculars, which are more compact but also more expensive. The rise in popularity of roof prism binoculars is as a direct result of this system being favoured in the development of instruments with user oriented features. These include; internal focusing for waterproofing, long eyerelief eyepieces that enable the viewer to obtain the full field of view with or without glasses and close focus making them useful for watching butterflies and other insects. B when seen on roof prism binoculars including Opticron BGA = full field of view for spectacle wearers. GA = rubber armouring and W or WA = wide angle vision. CF, (centre focusing) is more popular than IF (individual eyepiece focusing) especially when you need to focus at different distances under 50m. Most ‘IF’ binoculars are 7x magnification and have a large depth of focus which tends to eliminate the need for focusing adjustment at distances over 50m. For general observation choose a 7x or 8x magnification.. The amount of light entering a binocular is directly related to the surface area of the objective lens (OG). A 50mm OG will admit 2.5x the light of a 30mm OG. The amount of light reaching the eye is known as the exit pupil diameter (EPD) and its’ size can be found by dividing the OG diameter by the magnification. For example the EPD of an 8x32 = 4mm while the EPD of an 8x56 = 7mm. As a general rule the iris dilates between 2 and 3 mm (bright sunlight) and 6 and 7 mm (twilight) and so a choice should be made on the type of use the binocular is being put to. For general use choose a 7x42 or 8x42 binocular with an EPD of +5mm. The field of view of a binocular is expressed as either the width of panoramic view in meters from a distance of 1000m or in degrees. For example: 1� = 17.45m approx. A binocular is usually stated to be a wide-angle instrument if the angular field in degrees when multiplied by the magnification gives a figure equal or larger to 65. The field of view of a binocular is dependent on the manufacturers design and for a given design directly related to the magnification. As you read through the catalogue and compare models in the same range, you may find that on occasions the 10x magnification model gives a similar, equivalent or larger field of view as the 8x magnification model. This is because different eyepiece designs are often used within a single range. As mentioned, most binoculars are focused by turning the center focusing wheel. 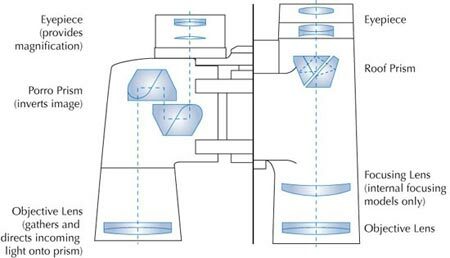 If, however, there is a difference in strength between the eyes, the dioptre scale (usually located on the right hand eyepiece) can be adjusted in order to compensate. To set the binoculars for your eyes, focus with your left eye on an object using the focusing wheel. When the object is in sharp focus, close your left eye and open your right adjusting the dioptre ring until the image being viewed becomes sharp. Opening both eyes should the reveal the sharpest picture at all distances. For many people, small, lightweight binoculars that can be taken anywhere will be used much more than larger, heavier ones which tend to be left at home or in the car!